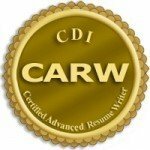 Congratulations on embarking on step one of the CARW process. You’ve taken the first step of attaining the certification guide and resume evaluation service. Download and read the Certification Guide and consider purchasing and reviewing any recommended reading (listed in the book). Select your sample resume for submission. NOTE: This should not be a resume you have written about yourself.